Weeks after suggesting he wouldn't run again, Wheeler launched an eye-popping fundraising drive. 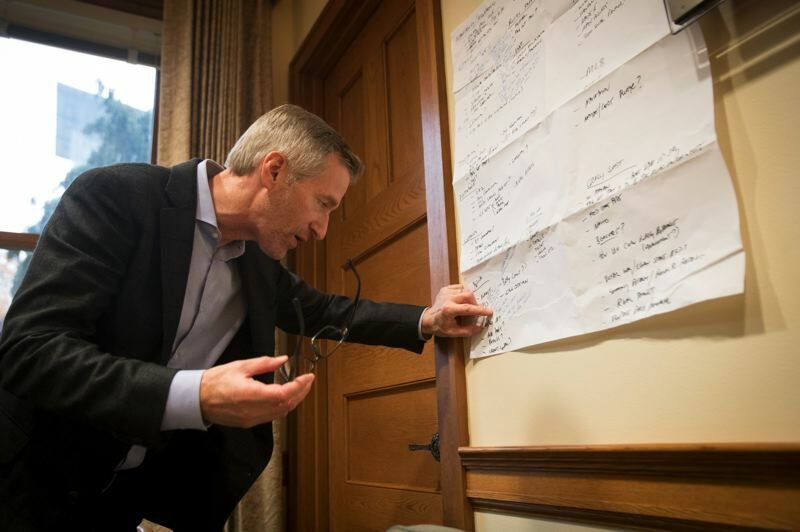 Two weeks after a muttered gripe sparked speculation that he would not run for reelection, Portland Mayor Ted Wheeler launched a campaign fundraising drive that garnered $87,000 from an array of developers and unions, campaign reporting shows. The contributions are interesting in light of the comment overheard after a Nov. 15 public appearance where he was heckled. "I cannot wait for the next 24 months to be up," he said, a comment promptly tweeted out by The Oregonian's Molly Harbarger. One local wag promptly dubbed it "Muttergate." Hours later, Wheeler denied having made a decision on reelection, and two weeks later walked his statement back even further in an interview with the Portland Tribune — saying he "expects" to run and had been "raising funds for a re-election campaign" even since Nov. 15. The contributions are also interesting in light of contribution caps that were recently approved by voters but which have not yet been approved by the Portland City Council. Regardless, it seems Wheeler has been raising funds with renewed vigor. In November, his one contribution came in on Nov. 14, from John Andrews of Melvin Mark Properties for $5,000. On Dec. 7, Wheeler took in another $5,000 from Jim Mark of the same firm. And then came 22 more contributions that month. Of those, 15 came in during just the three days after Christmas, for a total of $58,500. The biggest contributions included $25,000 from Local 48 of the International Brotherhood of Electric Workers, followed by $10,000 apiece from Nike, Inc. and Peter Stott, a trucking magnate and investor. Another $10,000 was split between four business entiities affiliated with Tom Brenneke, a local developer and property manager. "I would call that a warchest-building operation," said local lawyer Jason Kafoury when the contributions were read to him over the phone. Kafoury was active in a campaign finance reform measure that passed in November, setting caps of $500 on individual contributions in city of Portland elections. The contribution caps don't go into effect until an implementing ordinance is approved by the Portland City Council. That must take place by September 2019, under the measure. Given the timing, it's unclear if Wheeler is trying to scare off potential challengers for his job, to bank contributions before the new contribution limits make fundraising more difficult, or both. It's also unclear if the funds might be redirected to run for a different elected post. His campaign consultant, Jake Weigler of Hilltop Public Solutions, declined to shed light on his client's thinking, instead issuing a generic comment by email. "Ted throughout the year has been securing resources to work on the issues that matter to the community," Weigler wrote. "He raised over $100,000 to expand affordable housing creation through the recent housing bond. He supported the campaign to oppose the profiling of immigrant Oregonians and the campaigns to elect more Democrats to the Legislature. He is committed to continuing this work in 2019 and appreciates the support he is receiving from the community." Wheeler's three-day post-Christmas fundraising binge compares favorably with his pace in April 2016, shortly before his victory over Jules Bailey. That month, he raised nearly $250,000, meaning a pace of about $8,000 a day in the runup to the May primary. In comparison, none of Wheeler's fellow incumbents on the Portland Council raised a penny in December. The only candidate who has declared their intent to run for Wheeler's job in 2020 thus far, community activist Teressa Raiford, raised $155.00 in December, split among three contributions. She has raised $6,652.61 so far. In a Jan. 2 tweet, Raiford wrote that "Our committee doesn't have a handful of of rich buddies," adding that "it has many small donations" from the community. Wheeler's closest city-level competition in fundraising came from Commissioner Jo Ann Hardesty, who was sworn in on Jan. 2. Since her Nov. 6 victory over Multnomah County Commissioner Loretta Smith, Hardesty has received 41 contributions totaling more than $10,500. Hardesty has been a vocal proponent of the contribution caps sought by reformers like Kafoury — indeed, some of the reformers considered the measure a two-fer that would highlight Hardesty's stance on the issue and thereby help their ally win the council race over Smith. Hardesty's post-election contributions have maxed out at $500 in apparent recognition of the victorious city campaign finance measure. 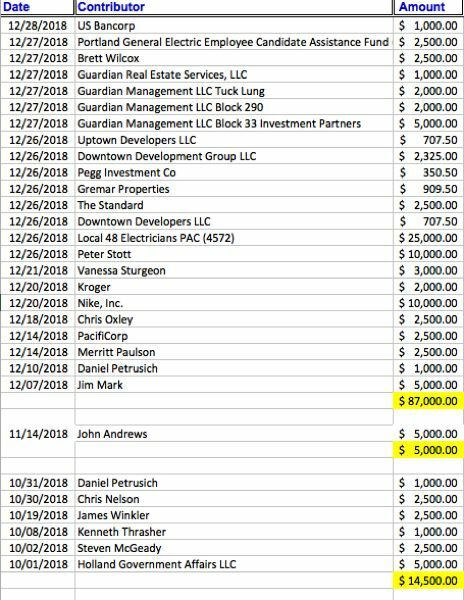 There were 17 such $500-givers in December, including lobbyist Len Bergstein, former state Sen. Chip Shields, real estate developer Thomas Cody and Julie and Cliff Hockley, owners of Bluestone & Hockley, a real estate firm. Anna Nguyen, who managed Hardesty's campaign, said it's common for candidates to raise money during their term to help sponsor community events, maintain the candidates' website, and for other purposes. Asked whether Hardesty is considering a run for another office, Nguyen said that right now, Hardesty is focused on the job she was elected to do, "and that job alone." Reformers, meanwhile, hope to make the voter-approved contribution caps go into effect as soon as possible. "We look forward to quickly implementing an ordinance to put measure 26-200 into place to limit campaign contrbutions in 2019," Kafoury said. This web article has been updated with information about community activist Teressa Raiford, who has declared her candidacy for mayor.